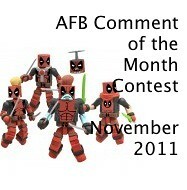 The AFB Comment of the Month Contest for November 2011! 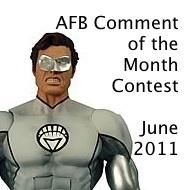 First off, thanks to everyone who commented on last month’s blog posts! Congratulations to my very good friend fishmilkshake for being our randomly selected winner! 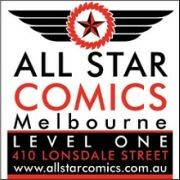 Once we hear from FMS, either the DC Universe Classics Wave 19 Atom Figure from Mattel or the Walking Dead Series One Michonne figure from NECA will be on the way when available from Mike’s Comics N’ Stuff. 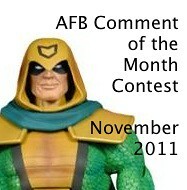 Now to November’s Contest: on offer are two great prizes, either the DC Universe Classics Wave 19 Kobra Figure from Mattel or the NYCC Exclusive Deadpool Minimates set from Art Asylum- either of which would be a great prize! Yay me!! Do the happy dance! Thanks to Andy and Mike! !